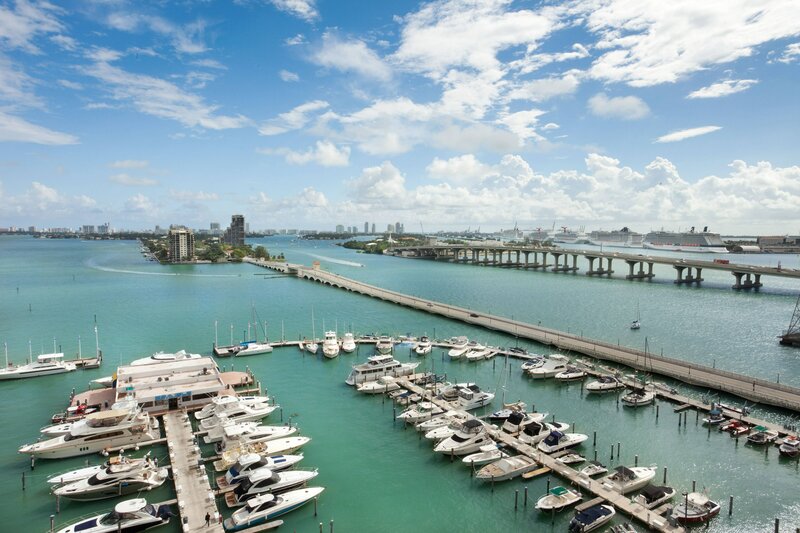 Edging the waterfront, Miami Marriott Biscayne Bay offers stylish comfort in a scenic downtown location. Unpack your bags in thoughtfully appointed hotel accommodations, featuring spacious floor plans, modern amenities, work desks, high-speed wireless internet and beautiful views of the city or Port of Miami. Discover an incredible collection of attractions, including American Airlines Arena, Bayside Marketplace, Adrienne Arsht Center for the Performing Arts and legendary South Beach. Host flawless events in 20,000 square feet of sophisticated spaces, designed for unforgettable meetings, weddings and social affairs. After a full day of business, shopping or sightseeing, refresh in the sparkling waters of our pool of treat yourself to distinctive cuisine at our signature restaurant. With a sleek fitness center and stylish poolside bar, our waterfront hotel is a breathtaking oasis, where contemporary comfort is complemented by the incomparable beauty of downtown Miami, Florida. Plan a reunion the whole family will remember at the Miami Marriott Biscayne Bay. Stay amid art, theater, shopping and professional sports, all within minutes of your spacious room at our hotel in Miami, Florida. Celebrate and socialize in our Florida DEP Palm-2 level venues, featuring dynamic indoor and outdoor spaces with inspiring views of the port. Embrace stylish comfort in thoughtfully appointed hotel rooms and suites, featuring modern essentials and gorgeous views of the Miami waterfront.